I’m pleased to announce that I’ll be adding a new feature to HealthyFellow.com. Periodically, I will review natural products that may be useful in furthering your own health goals. My intent is to offer an unbiased, third-party assessment of the substance and functionality of a wide array of supplements and natural care items currently available at a health food store near you. Please note that neither myself nor anyone else affiliated with this website has a financial or any other relationship with the manufacturers of the products being reviewed. I buy these items myself and critique them solely on the basis of their merit. 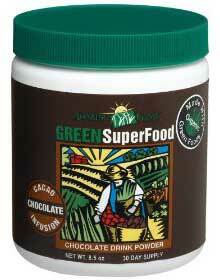 The first product I’ve chosen to review is Chocolate Green SuperFood by Amazing Grass. It’s a powdered supplement that combines a variety of green foods such as organic spinach, broccoli and alfalfa with antioxidant-rich fruits and vegetables. It is further enriched with a blend of organic cocoa extracts, pre and probiotics, fiber and digestive aids. What’s the purpose of this product? Chocolate Green Superfood can help fill in the gaps of any diet that may be lacking in plentiful amounts of organic fruits and vegetables. It’s rich in minerals, vitamins and phytochemicals (health-promoting plant chemicals) that many people do not get in their typical daily diet. How does the product taste? How much does it cost? Many “green drinks” taste a lot like what you’d expect. Imagine the taste of fresh cut grass with added vegetables. But this particular product actually tastes really good! The rich chocolate flavor completely masks the grassy taste of the primary ingredients. I also like that it manages to do so without adding any sugar, artificial flavors or artificial sweeteners. I bought this product online, which is where you can often find the best prices. The per serving cost comes to just over 50 cents per scoop. In my experience, this seems pretty reasonable when compared to similar products in this same category. What are some of the noteworthy ingredients in Chocolate Green SuperFood? The second most prominent group of ingredients is the organic cocoa blend. I’ve written extensively about my regard for this incredible food. This formula provides a large enough dosage (of cocoa extracts) that could possibly confer health benefits, in addition to contributing to its delicious taste. Chocolate Green Superfood could very easily be mixed with any kind of milk for a delicious tasting and healthier version of chocolate milk. It would also be a good addition to hot cereal, protein shakes and even yogurt. Lately, I’ve been adding a scoop of these greens to some purified water, whey protein and coconut oil or milk. I put all the ingredients in a small cup with a lid and shake it until it’s completely mixed. Delicious! Using a 1-10 scale, I give Chocolate Green Superfood a 9 out of 10. I can always think of ways of improving existing products, but this one is really quite excellent as is. The real standout quality is the ideal blend of nutrient-dense ingredients and genuinely decadent taste. I think even those with a sensitive palate will find this to be a pleasant surprise. If you’d like to give this product a try, look for the individual serving packets which are available at some health food stores. I always like being able to try something out before investing in a larger canister (consisting of 30 or 60 servings). I will give this a try. Most superfoods are not so great tasting, as you mention, which always tends to keep me from consistently taking them. I completely understand what you mean. I hope you find this product to be much more “user friendly”. Thanks for chiming in, MH! I agree. It really does taste unhealthy … but it’s not! Talk about a win-win situation! I have a very sensitive palette and had bought greens before and couldn’t take it. At my local health food store the guy working told me about this. He was right! It is good! Doesn’t taste like I’m drinking anything from my law mower.. Lol.. I blend it with almond milk, a bit of water, frozen strawberries, a healthy fat oil (udo) I think, and a little bit of pure cacao powder.. Soooo good! Chocolate berry drink, how can you go wrong!.. I give this product a 10 out of 10.. Hope you guys like it too! Thanks for sharing your take on this! We agree! Int J Food Sci Nutr. 2016 Feb 17:1-4. Spirulina may increase people’s ability to resist mental and physical fatigue. This study tested that hypothesis in a randomized, double blinded, placebo controlled study in men. After 1 week, a 3 g/day dose of spirulina produced a small, but statistically significant increase in exercise output (Kcals consumed in 30 min exercise on a cross trainer machine). A mathematical based mental fatigue test showed improved performance 4 h after the first time of supplementation as well as 8 weeks later. Similarly, a subjective survey for a sense of physical and mental fatigue showed improvement within 4 h of the first supplementation as well as 8 weeks later. These results show that spirulina intake can affect fatigue in men.